I see a blue one with a white racing stripe in Dublin, Georgia sometimes, usually in the Wal-Mart parking lot. I saw one of these today parked outside a FishWorks, it as black with red, this thing Truly has road presence in it, it really does, its a lot smaller up close then i thought it would be though, i thought it had an aftermarket hood because i was walking up to it from the back, and that raised hood looked big, but it was stock. As a rare site on UK roads, it was truly a spectacle, But yeah this pictures in no way do this car justice and i can only imagine what a 2013 GT500 is like in person in that same color. @Viking Hey I noticed Fastestlaps re-posted lap times of cars equipped with things such as cages and racing seats. I thought they were removed for that soul purpose. Was there a change in policy or something? @MondayBlues in the 2011 edition of the Car and Driver Lightning Lap, they point out the Ford factory lap time for this car at VIR is 2:58.5 which is faster than their 3:04. However, it was done using a racing seat. I haven't added the factory time, because I think the racing seat has much better side bolsters than the stock seats, thus an unfair advantage. What is your opinion? The GT500 wasn't available for testing yet when they did that comparison, unless you mean the 2010 GT500...which is significantly slower around a track than the 302 LS. Makes me wonder why MT didn't use the GT500 against the ZL1, instead of the BOSS LS. Believe me that the new GT500 It's not in the league of the ZR1. It would be maybe quicker than the ZL1 at straight line, and little bit slower at the track. Thats my bet. But it has no chance against the Corvette, that's why it cost about 40k more. Cant wait for the 2013 Gt500, 650hp and over 200mph, its gonna be something. More powerful than a Zr1 and a heck of a lot cheaper. You would be surprised to learn what you can arrange if you talk to a franchised Ford dealer. I'd be willing to bet that they'd get you one without stripes if it meant they'd make a 40+k dollar sale. Not saying the GT500 isn't a good / fast car just not that good. I want a Boss 302 without all the stripes. Why do they got to screw it up with all the "look at me" crap? It would look much better looking like a standard GT with lower suspension / upgraded wheels&tires. 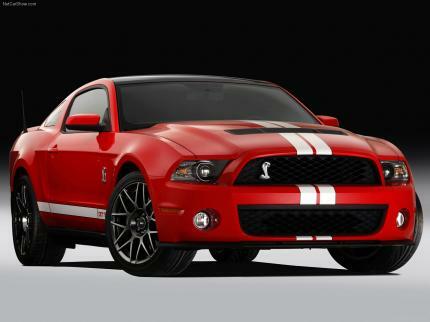 2013 facelift models revealed, the GT500 gets a 5.8L supercharged V8 with 650hp and 600lbft. weight will be 3850lbs. It won't be deleted, the time is valid, Randy is just so much faster than the drivers that have tested on streets of willow so far. hahahahahaahh! faster than a zr1. i dont like the zr1, but man, thats just something called "false information"
The Brembo brakes have been used since the GT500 came out, nothing new. The electric steering on the other hand definitly is an improvement. 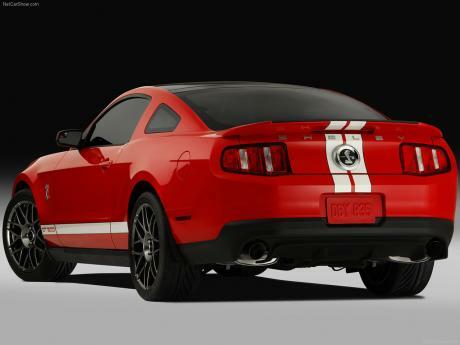 The 2011 model Mustangs have tighter feeling steering response. The new aluminum block saves weight which definitly helps. But more importantly, it might be helpng to disipate heat. The supercharged Mustangs have had a problem with heat soak. The engine computers can adjust to save the engine, but in doing so they cut most of the extra power generated by the supercharger. Normally aspirated Mustangs don't have this problem. Well I know that the VIR and the Willow Springs Streets lap time are definitly with the 2011 model year. The Streets lap time is by Randy Pobst, an excellent pro driver. The VIR time is by the Car and Driver guys. They are sometime racers as well, but probably not as good as Randy. Does anyone know for sure the laptimes are for the 2010 (iron block) OR 2011 alum block, electric steering, brembo brakes? Motortrend needs to start using Randy Pobst for all its lap times. This guy was quicker in the GT500 than edmunds was with the ZR1 and he drove a Z06 Carbon quicker than Motortrends 458 time. I think this shows just how screwed up these lap times can be depending on driver.. also goes to show what a pro driver can do compared with your typical car reviewer. When I said lighter engine, I meant that the new 2011 Mustang Shelby GT500 has a lighter engine than the 2010 model that it replaces. The normally aspirated Corvette engine could very well be lighter than the supercharged Ford/Shelby engine. It should be at least! Hi Georg, I think you meant to say Road and Track (not Car and Driver). I actually trust the Car and Driver scales, they seem to be pretty consistent. Road and Track are pretty inconsistent on weights. Both magazines have good road racer drivers, but they tend to be not as good at getting some cars to accelerate consistantly. 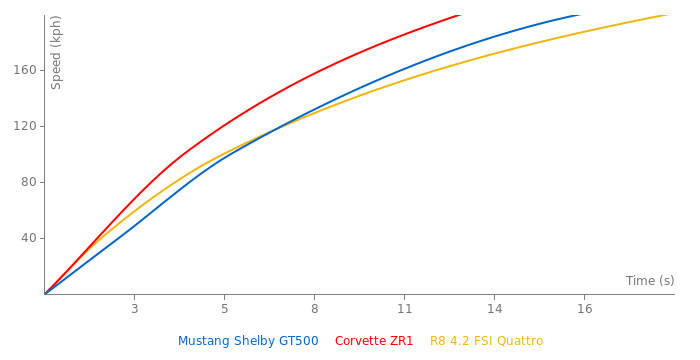 Even with the lighter engine, the Mustang Shelby GT500 (proper name) is too heavy to match the lightweight Corvette Grand Sport on most road courses, most would agree with that assessment. and their buyers guide also claim 3820lbs..
0-100 in 4,9 and 0-200 in 14,3s.